Various birthdates are given in different sources. The dates are 18 Dec 1899, 12 Dec 1900, 18 Dec 1901, 12 Dec 1899. Tombstone says "Capt US Army World War II, Dec 18 1900 - Feb 13 1967". 1. Occupation: Telephone lineman, 1918, Missouri, United States. 8553 Missouri Telephone and Light Co, telephone lineman, construction work, 1918 to 1921. Listed as a civilian job before Campbell joined the military. 2. 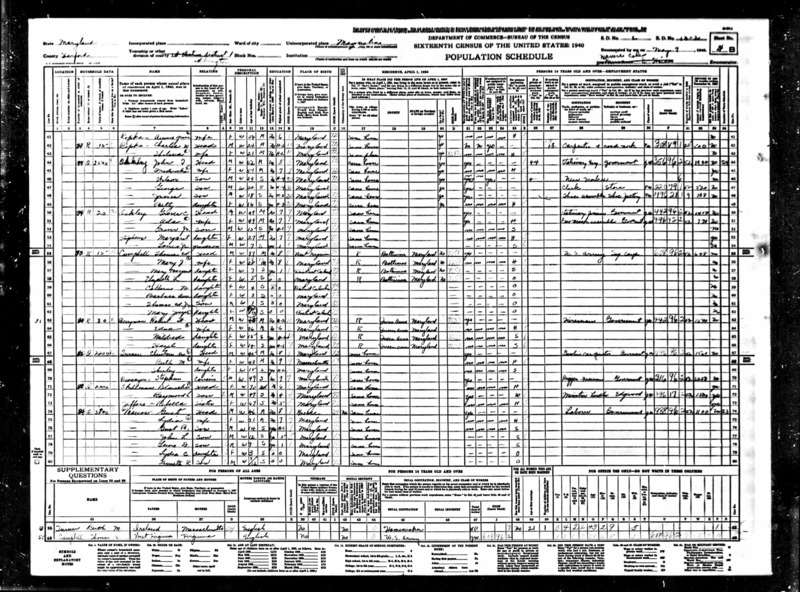 Census, 1920, Logan County, West Virginia, United States. There is an interesting entry in the 1920 census. In Logan County, West Virginia, there is a Thomas Campbell, age 23, but head of a family that includes brother Carl, age 21, brother Henry, age 18, brother John, age 16, sister Rathine? Hiller, a 26 year old widow, neice Mary, age 8, and neice Della, age 6. All are born in Kentucky, and parents born in Kentucky. All the brothers are miners in a coal mine. (Logan County, Logan Mag. District, ED 27, sheet 19, enumerated 19 Jan 1920) I have a copy of this census record. 3. Occupation: Signal Lineman, Bef 1923. 8553 Missouri, Kansas and Texas Railroad. No date given, but listed as a civilian job before Campbell joined the military in 1923. 4. Military Service: Army (enlisted as Sgt), 11 Jan 1923. 8553,8554,8555 14th Field Artillery, Section Chief, Battery Commander Detail, Battery C.
7. Military Service: Army (Sergeant), 26 Nov 1925. 8553,8555 8th Field Artillery, Supply Sergeant, Section Chief, Battery C.
9. Military Service: Army (Sergeant), 3 Jun 1929. 8553,8555,8556 5th Field Artillery, Section Chief. Starting date of 3 June 1929 is given by Statement as to Military Service, starting date of 26 Nov 1928 is given by letter requesting relief from active duty and application for retirement. 10. Military Service: Army (Sergeant), 26 Apr 1930, Fort Howard, Baltimore County, Maryland, United States. 8553,8555 16th Signal Service Co., Wire Chief, Telephone System, Post Signal Supply. 12. Military Service: Army (Sergeant), 26 Apr 1933. 8553,8555 16th Signal Service Co., Wire Chief, Telephone System, charge Third Corps Area Public Address work, Post Signal Supply. 15. Military Service: Army (Sergeant), 15 Jun 1935. 8553 16th Signal Service Co., charge Third Corps Area telephone construction crew, installing switchboards, installing new telephone cable, conduit system. 17. Military Service: Army (Staff Sergeant), 7 Mar 1939. 8553,8556 16th Signal Service Co., Wire Chief, Post Signal Supply Sergeant. Date of 7 Mar 1939 given in Statement as to Military Service, date of 26 Apr 1939 given in letter requesting relief from active duty. 20. 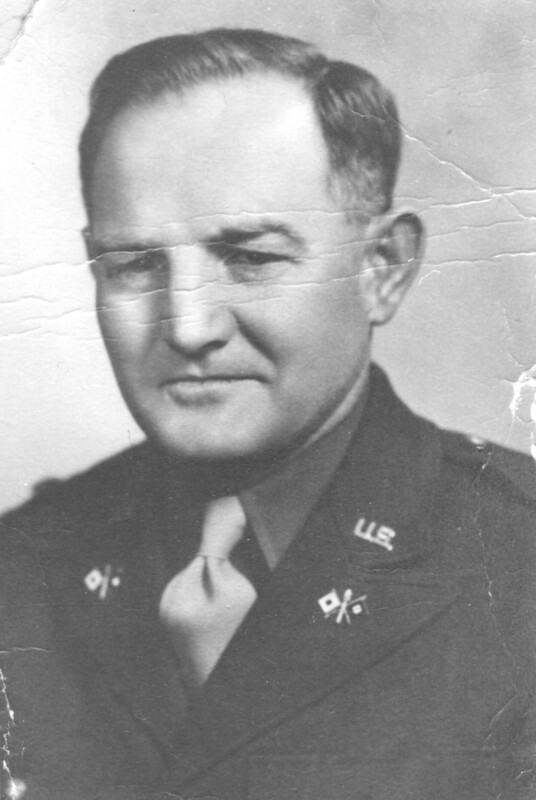 Military Service: Army (Master Sergeant), 4 Nov 1940. 8553,8556 16th Signal Service Co., Wire Chief, Telephone System, charge of telephone construction and maintenance. Rank of Master Sergeant given in Statement as to Military Service, rank of T/Sgt given in letter requesting relief from active duty, with a later date of 19 June 1941 for M/Sgt. 21. Military Discharge: Army (discharged as Master Sgt), 15 Nov 1942. 8554,8555 Discharged from 16th Signal Service Co.
22. Military Service: Army (enter on active duty as 2md Lieutenant), 16 Nov 1942, Fort Meade, Anne Arundel County, Maryland, United States. 8546,8553,8555,8556 Signal Corps. Assistant Post Signal Officer, 1322nd Service Unit, Fort George G. Meade. 24. Military Service: Army (1st Lieutenant), 27 Dec 1942. 8553,8556 Signal Corps. Post Signal Officer, 1322nd Service Unit, Fort George G. Meade. In January 1943 installed telephone system at Tobyhanna, PA, for training of Air Corps Ground Force. Supervised the telephone maintenance and installation of secret telephone system in Maryland. Supervisor comments say "Lt. Campbell is unquestionably one of the best telephone construction and maintenance men in the Third Service Command. He has supervised, as an enlisted man, some of the largest telephone installation projects in the various posts throughout the Third Service Command. He is also familiar with the functions of supply." 25. Military Service: Army (Captain), 19 Jun 1944. 8556 Signal Corps. Letter requesting relief from active duty specifies end of this time of service as 12 Jan 1948. 26. Property: Real Estate Assessment, 14 Jun 1945, Anne Arundel County, Maryland, United States. From County Commissioners of Anne Arundel County, June 14th 1945. The new assessment is $150.00 for Land, nothing for Buildings. This is the same as the previous assessment. Eviction Notice to Mr. Charles G. Johnson, Sheehan Property, Crownsville, Maryland, was set at six months due to the fact that I am a discharged veteran with twenty-four years service and still in service until Government sees fit to discharge me again. I would like to know if this Eviction Notice could be limited to four months instead of six months as the house I am now renting will have to be evacuated as soon as possible and I need this house for my own family. Mr. Johnson is also complaining and does not want me to repair the house or work on it in any way while it is occupied by him. 28. Military Award: Army Commendation, 31 Oct 1946, Baltimore, Maryland, United States. 8557 From www.gruntsmilitary.com: The Army Commendation Medal is awarded to any member of the Armed Forces of the United States other than General Officers who, while serving in any capacity with the Army after 6 December 1941, distinguished himself by heroism, meritorious achievement or meritorious service. Awards may be made for acts of valor performed under circumstances described above which are of lesser degree than required for award of the Bronze Star Medal. These acts may involve aerial flight. An award may be made for acts of noncombatant-related heroism which do not meet the requirements for an award of the Soldier's Medal. 29. Military Discharge: Army (relief from active duty as Captain), 27 May 1948, Valley Forge Hospital, Phoenixville, Chester County, Pennsylvania, United States. 8546,8555,8556 On 20 April 1948, Campbell sent a letter to the Adjutant General, Department of the Army, requesting relief from active duty under the provisions of Section IV, Dept of the Army Circular 54, dated 25 Nov 1947. He states in the letter that he intends to reenlist in the Regular Army the day following the effective date of completion of active duty and then retire. The actual relief from active duty occured on 27 May 1948. 32. Military Discharge: Army (retirement as M/Sgt), 31 May 1949, Valley Forge Hospital, Phoenixville, Chester County, Pennsylvania, United States. 8547,8559,8560 On 17 May 1949, an Army Retiring Board for Officers was convened at Valley Forge General Hospital, Phoenixville, PA regarding Captain Thomas E Campbell of the Signal Corps. Two medical witnesses appeared before the board. Campbell was determined to be permanently incapacitated for active service due to diabetes mellitus (mild, cause undetermined). The approximate date of inception was Dec 1941, which was also when Campbell became incapacitated. On the form recording the board results, where is asks if the cause of the incapacity is an incident of service, it says "No as an officer", but someone has written "yes as enl" [so I think this means that, in Dec 1941, Campbell was still enlisted thus there is no reason that the diabetes was caused by his service as an officer, which may indicate why he chose to retire as an enlisted man, perhaps getting some disability benefits at that grade]. A letter from the Adjutant General to Campbell, via commanding officer at Valley Forge General Hospital, dated 20 May 1949 restates the results, saying "It has been determined that your physical incapacity was not incurred in line of duty while on active duty as a commissioned officer", and "You are considered by the Department of the Army to be permanently physically incapacitated for active military service." 37. Appearance in Document: Social Security Death Index, Feb 1967, Anne Arundel County, Maryland, United States. 8551 Thomas Campbell, SSN 219-28-0757, issued in Maryland before 1951, born 18 Dec 1899, died Feb 1967, last residence Crownsville, Anne Arundel Co, MD. 38. Story. 7463 Born in West Virginia (maybe), lived in many places in Army including St Louis, Illinois, and Maryland. Died in Maryland. 39. Story. 7463 His exact birthdate is unknown. He lied about his age in order to enlist in the US Army. Several of his Army records have conflicting dates, with birthyear between 1899 and 1904. 40. Story. According to daughter Peggy, a box of records of his show three birthdates, all Dec 18, but years 1898, 1899, and 1900. The same box of records says he went to high school in Huntington, WV. 41. Story. Interestingly, the birth certificate for Peggy Raupuk, Ed's first child, says Ed was born in Virginia. However, the "Virginia" is on the far right of the area on the birth certificate where the birthplace belongs, so it's possible that it is supposed to say "West Virginia" but the "West" part is too faded to see. [certified copy of birth certificate in possession of Peggy Raupuk as of 2007]. 42. Story. There is some question as to whether or not his name was really Campbell. No records for him under that name have been found in Omar, where he said he was born. However, there are many other Campbells in the area. Ed said he came from a large family, but none of his children ever had contact with their father's family. 43. Story. His father worked in sawmills, and moved around a lot, so maybe Ed was born somewhere else, and just lived in Omar at one time. 44. Story. 7463 Ed was the third of five children. A sister, Mary Margaret, was the oldest and four boys followed her birth. One of his brothers was named William. Mary Jo said Ed told her that each of his brothers either had the name Thomas or the name Edward in their full name (for example, Thomas William or Edward William). Ed's sister and brothers had red hair or red tints to their hair. 46. Story. 7463 As a child of five or so, Ed and the family were in town, and passed a red-headed man in the street. His sister said that he was their uncle, his father's brother, and that he was a lawyer. The parents nor the man acknowledged each other. In later years, before Ed joined the army, he went back to Omar to find his family. There was no trace or people weren't talking of his sister or brothers. He went to the office of the lawyer and asked him if he was an uncle. The man said no, and asked Ed to leave. 47. Story. 7463 When his parents died, Mary Margaret's husband was left as guardian of the children. Ed did not like him, and ran away. After one attempt, and being brought back by the Sheriff, he caught a boxcar and left on a night train. He then spent a long time riding the rails. He also spent some time on a chain gang. 48. Story. 7463 According to Mary Jo, Ed promised to tell her something about himself three years after they were married. He never did tell her, although she asked him several times. He had a scar at his left elbow, which he told Mary Jo was from a bullet. 49. Story. At various times he recounted working at an Ice Cream Factory, a furniture factory, and at Anheuser-Busch in St. Louis. Mike Campbell says that Anheuser-Busch made ice cream during Prohibition, so maybe that's where Ed worked at the ice cream factory. According to the Anheuser-Busch website, during Prohibition (1920-1933), Anheuser-Busch built truck bodies and refrigerated cabinets, manufactured barley malt syrup and ice cream, and entered the baker's yeast business. 50. Military Service. He joined the Army in 1923. One of his first Army papers is from Jefferson Barracks, St. Louis, Mo, in 1925. This was after 2 years and some months in the Army. While at Jefferson Barracks he was in a Field Artillery unit, and was involved in chasing bootleggers on the Mississippi river. Another paper is from Fort Sheridan, Illinois, dated in 1924. He is described as 5 feet 5 1/2 inches, blue eyes, brown hair, fair complexion. He was stationed in the Philippines in the late 20s, and got malaria while there. This supposedly caused his hair to change from red to black. He was assigned to Schofield Barracks in Hawaii. He met Mary Jo when he was in Fort Howard, Maryland. He was also stationed at Edgewood Arsenal and Fort Meade. He was Wire Chief at Ft Meade. His Army number was 6493136. He retired from the Army in 1949. 51. Story: Fort Howard, Baltimore County, Maryland, United States. Fort Howard is on the north shore of the Patapsco River, east of Baltimore harbor. 52. Story: Edgewood Arsenal, Harford County, Maryland, United States. Edgewood Arsenal is part of the Aberdeen Proving Ground in Maryland. 53. Story: Fort Meade, Anne Arundel County, Maryland, United States. Fort Meade is at Columbia, Maryland. 54. Story. 7463 He built the house on the farm at Crownsville. He acquired the farm in 1948. The house is no longer there, but Campbell Rd is still there. The house was located at the end of that road. 55. Story. 7463 Nicknames included "Dusty", from an incident in the Army when he refused to march his troops on a parade ground that was too dusty. Also answered to "Capt". 56. Residence. Lived on Baltimore St (2300 block of W. Baltimore St). Later moved to ???. One day while living here, Peggy was sent out for a loaf of bread, and got lost. She told a policeman she was lost, but was unable to point out her house, so she spent the night in the Women's lock-up. When her parents filed a missing-child report, they were reunited. Later moved to Riggs Avenue, living with Hortense's family. Then moved to Fort Howard, then to Magnolia MD, then Edgewood Arsenal (on-base housing), then Fort Meade (two houses), then Odenton, then rented a house in Odenton on Pautuxent Road from the Ryan family. When that house was sold, they moved to a house near the crossroads in Odenton, rented from Brodsky family. Finally, moved to farm in Crownsville around 1946. Magnolia, MD is next to Edgewood Arsenal. Odenton is near Fort Meade. 59. Story. From wikipedia.com: Valley Forge Army Hospital is a former military hospital in Phoenixville, Pennsylvania. The hospital is near both Philadelphia and Valley Forge. This hospital was also called Valley Forge General Hospital due to the wide range of services provided. The hospital was built in 1942 to care for the wounded of World War II. It became the largest military hospital in the United States. Eventually, the hospital had about 3,000 patients and about 100 separate buildings. One feature of the hospital was its design to be mostly on one floor with enclosed ramps and hallways linking the many parts. The hospital was planned to be shut down around 1949, but remained open due to the size of military forces during the Cold War, Korean War, and Vietnam War. The final closing came in 1975, although it had stopped functioning as a hospital the previous year. The site is now occupied by the Valley Forge Christian College.